An undated handout photo provided by NASA shows the Thwaites Glacier in the West Antarctic. (CNN) - A pair of new studies released on Monday share a same ominous message -- that our planet's ice is melting at an alarming rate, which is bad news for global sea levels. According to a study led by Eric Rignot from the University of California at Irvine, which looked at details of ice and snow from the entire continent of Antarctica since 1979, Antarctica's crucial ice sheet has been melting for the entire 39 year period, but that is just the tip of the iceberg, so to speak. The research, published in the Proceedings of the National Academy of Sciences, found that the rate of that ice loss has not been consistent, with ice disappearing faster in each successive decade. Ice loss in Antarctica has increased from 40 gigatons (a gigaton is one billion tons) per year from 1979-90 all the way up to 252 gigatons per year from 2009-17, a 6-fold increase. And that melt-rate has been accelerating in the most recent decades, up 280% in the second half of the nearly 40 years compared to the first half, Rignot and his colleagues calculated. Understanding Antarctica and the delicate balance of ice melt draining into the Southern Ocean, and the replenishing snowfall over the continent's interior, is critically important when estimating how much seas will rise around the globe as a result of global warming. The continent holds a majority of the planet's ice and if melted, would cause the average sea level to rise 188 feet (57.2 meters). The study looked at 176 different basins around Antarctica where ice drains into the ocean and found that the rate of melting is increasing, especially in areas where warm, salty water (known as circumpolar deep water, or CDW) intrudes on edges of the ice sheets, which "vigorously melts the ice shelves" by reducing the glaciers that act as stop gaps between the ice sheet and the ocean, the study said. The study did not find a corresponding increase in the long-term trend of snowfall accumulation in the interior of Antarctica, which had been previously believed to counter the ice loss and minimize sea level rise. The imbalance between melting ice and replenishing snowfall means the continent is out of balance and thus increasing sea levels as the excess meltwater flows into the ocean. This challenges the traditional scientific view that the East Antarctic ice sheet is relatively stable and resistant to changes. While the study is in line with with previous research that the West Antarctic ice sheet has contributed the majority of the recent ice loss, it found that East Antarctica is not far behind when you look at the entire 40 year period. Rignot told CNN, "I did not expect the cumulative contribution of East Antarctica melt to be so large," and said the finding is significant because "melting is taking place in the most vulnerable parts of Antarctica...parts that hold the potential for multiple meters of sea level rise in the coming century or two." The study concluded that more observations are needed in the sparsely studied East, compared to the West where most scientific attention has been placed in recent years due to the alarming ice loss in that region. Another Antarctic study published Monday in the scientific journal Nature Geoscience compared the geologic record of Antarctica's ice with the known astronomical motions of the planet and the wobbling of the Earth's tilt. The researchers, led by Richard Levy of New Zeland's GNS Science and Victoria University of Wellington and Stephen Meyers of the University of Wisconsin-Madison, were able to recreate a broad history of the Antarctic ice sheet going back 34 million years to when the ice sheet first formed -- documenting multiple cycles of ice growth and decay resulting from natural variations in the planet's tilt. 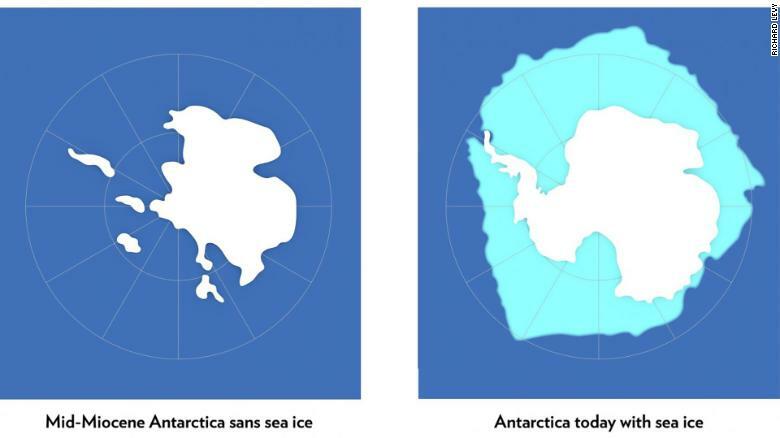 From study -- Roughly 15 million years ago, when Earth's atmosphere was supercharged with carbon dioxide, oceans warmed and sea ice around Antarctica disappeared, causing a significant part of the Antarctic ice cap to melt and dramatically elevate global sea levels (left). New research warns that a warming world caused by increased carbon dioxide in the atmosphere and coupled with periodic changes in the geometry of Earth's orbit could warm oceans, leading to a loss of sea ice (right) and sparking a dramatic retreat of the Antarctic Ice Sheet, and elevate sea levels worldwide. "What this study does is characterize the growth and decay of the Antarctic ice sheet and sheds light on what is forcing it to change," explains Meyers. But Levy and Meyers found that sea ice, the thin frozen layer of ocean water that surrounds Antarctica, plays a critical role in protecting the miles-deep ice on the continent from the warmer ocean that surrounds it. "Sea ice creates a barrier between the ocean and the ice," Levy said. In linking the long record of Antarctica's ice sheet natural growth and decay with the geologic record, Levy and Meyers were able to show that naturally occurring elevated carbon dioxide levels in the atmosphere and the resulting loss of sea ice around Antarctica were major drivers in the eventual instability of the entire ice sheet. This suggests that current elevated carbon dioxide rates, which have risen to highs never seen by humans due to carbon pollution, could reduce Antarctic sea ice and that barrier could be lost. "If we fail to achieve carbon dioxide emissions targets and Earth's average temperature warms more than 2 degrees Celsius, sea ice will diminish and we jump into a world that is more similar to that last experienced during the early to mid-Miocene," Levy said, which was at least 14 million years ago and featured temperatures 3-4 degrees Celsius (7 to 9 degrees Fahrenheit) above the pre-industrial global average where much higher carbon dioxide levels and sea levels were the norm. Currently, Antarctica's sea ice is at the lowest January levels since detailed observations began in 1979, according to data from the US National Snow and Ice Data Center. 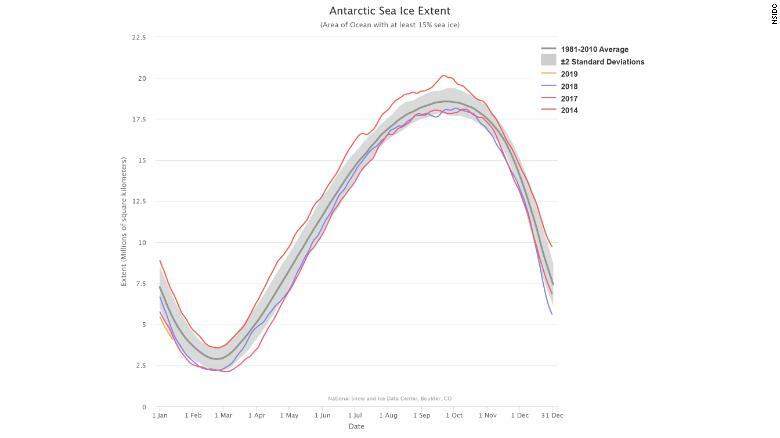 This continues a trend of record low sea ice in the Antarctic over the past several years, reversing previous record highs that were frequently pointed to by climate change skeptics as a counter-argument to global warming. "All of these data suggest we need to get cracking and reduce our greenhouse gas emissions," warned Levy, "we don't want to lose that sea ice."